If you like PipeDream on the Z88, why not install it on your PC and avoid having to convert files altogether? PipeDream is no longer sold. As this software was released in 1988 and is of no commercial value now, it has been put on our web site for download. The excellent manuals, on the other hand, are now sold on their own. I wish to take this opportunity to remember the author of this software Mark Colton (17 March 1961 - 5 August 1995) who is still greatly missed. The commands that are used on the Z88 and the computer are the same (the diamond key becomes the Alt key). Using a PC Link ROM and the correct cable you can 'log' onto your Z88 (as drive Z) and easily fetch or save your files directly to or from the Z88 in PipeDream on the computer. so that your PipeDream files can be imported into the latest Windows packages without losing any of the calculations hidden in spreadsheets. "All I do now is to subtract 20 years with date entries," said Vic, who still uses Pipedream. We have done some tests on PC PD to see if it is compliant. 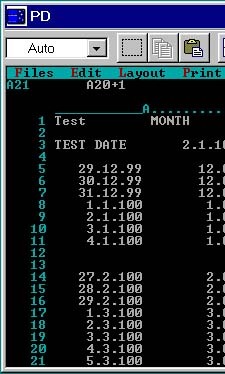 The "DATE" command picks up the right date from our computer clock (after setting it to a 2000 date) and the calculations work as shown on the above screen shot. Year 2000 is now known as year 100. The last date that PC PipeDream can calculate is 19.1.102. You can convert your old PipeDream files to Lotus 1-2-3 format and carry on working on the file with a different spreadsheet package. Buying the PipeDrearn-PC file back in May was one of the best buys I have had for ages.Previously I had updated my RISC-PC computer and got the latest version of Fireworkz as it seemed the only way of transferring RISC Pipedream to PC formaL It did it but the amount of editing work was tremendous and in fact it was quicker to retype! Mostly I wanted to transfer Family Trees which I had set up in column A so that the layout could vary on the various sheets in a file. It was not a spreadsheet. There is a sample sheet attached and this complete file runs to 19 pages, all of which are transferred faultlessly. I needed to use my original printer driver. There are many other files too so the amout of work involved was enormous. The full version of PipeDream is now available as a free download. There is no warranty with this software. Please read the readme.doc file first. There is also an icon that you can assign to the program. Download the software from here, put these files in a separate directory named 'PIPED' in your 'Program Files' and type 'PD' to run. 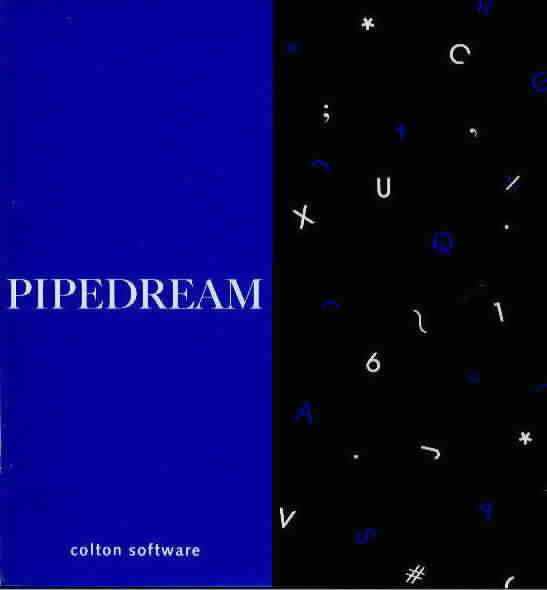 Try out PipeDream now before ordering the full version. Download the software from here, put these files in a separate directory and type 'DEMO' to run. Running PipeDream after Windows xp may be a problem. Here is one solution. So, my old desktop (running XP) died, and I was forced to purchase a 64 bit Vista based machine, which is fine except that none of the z88 programs will even install, let alone run. I had issues with pipedream and eazylink in particular. I installed DosBox. I installed it in a folder on C:\. I then edited the config file (dosbox.conf) to give me a serial port. at the appropriate point in the config file. to the end of the dosbox.conf file. Then when I execute dosbox, it mounts C:\z88 as the entire C drive, I cd to the pipedream directory and type PD (I will write a batch file to simplify this). Once in Pipedream, I can save and load files to the Z88 via the serial port and cable. I have a real com1, I havent tried to use a USB>serial adaptor. I will be loading eazylink the same way, by copying the CD files into the C:\z88\eazylink folder and installing from within dosbox. from there the files are accesible for emailing, storing, copying etc. There are also some articles and leaflets that I have found that you might be interested to read.